There is not more famous place in Thailand than Phi Phi archipelago. It is probably one of the most known islands in the entire Southeast Asia. Although we did not have any large expectations we had to go there. Yes, even the trip around the world could not go on without seeing such places. Ferry from Koh Lanta to Koh Phi Phi cost 200 THB/person (cca 5.60 USD). 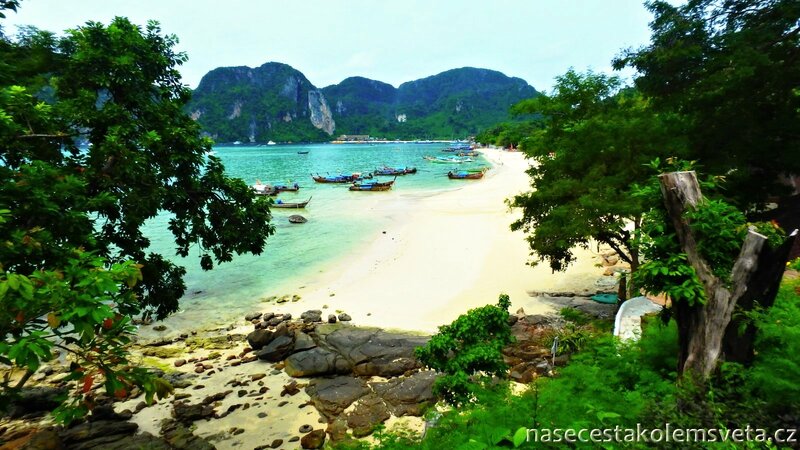 Getting to Phi Phi Islands was not so expensive but staying here is not such a fun, especially for backpackers. We were looing for cheap accommodation in the quiet part of the island because we also wanted to rest. Certainly we do not recommend to anybody stay in the center because you will never be able to sleep, it is too loud there. We stayed at Coco’s Guesthouse for 600 THB/night (cca 16.72 USD) which was located about 900 meters from the Ao Tonsai Pier. It was the most expensive accommodation in Thailand for us. On the other hand one of the best places on Koh Phi Phi and air-con included. 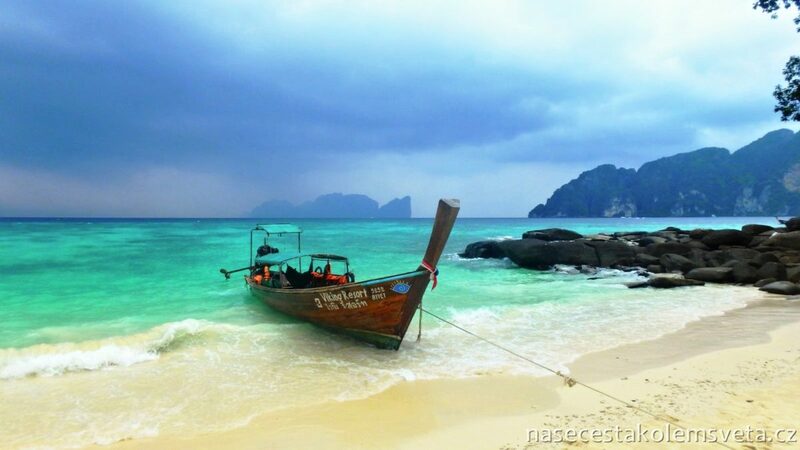 There are many things to do in Phi Phi Islands but of course not for free. Well most of them are not free of charge. We decided to go for a walk on the island. 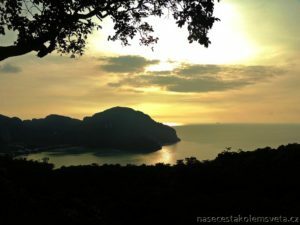 The best place where to sight the whole island is at the viewpoint on a hill. It is quite a hike so take water and have fun. In front of the last part of the hill we had to pay to the local guy. 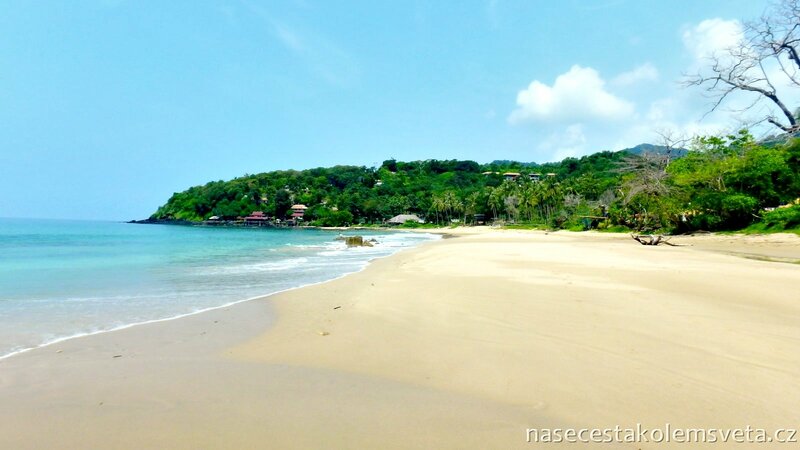 It was a private property and he required 30 THB/person (cca 0.85 USD). But it was really beautiful up there, maintained and there were many plants and domestic animals. Idyllic but not for us because we experienced air polution caused by fires from Indonesia. We were advised to go for real Thai Massage. We savoured it. We relished the Thai massage at Fatima Massage & Spa. Experienced Thai women were taking care of our sore back for an hour. It cost us 250 THB/60 minutes/person (cca 7 USD). And enjoyed Thai massage twice because it was really amazing and the ladies knew where we felt pain and how to relief it. We could not say no to this because we were curious. 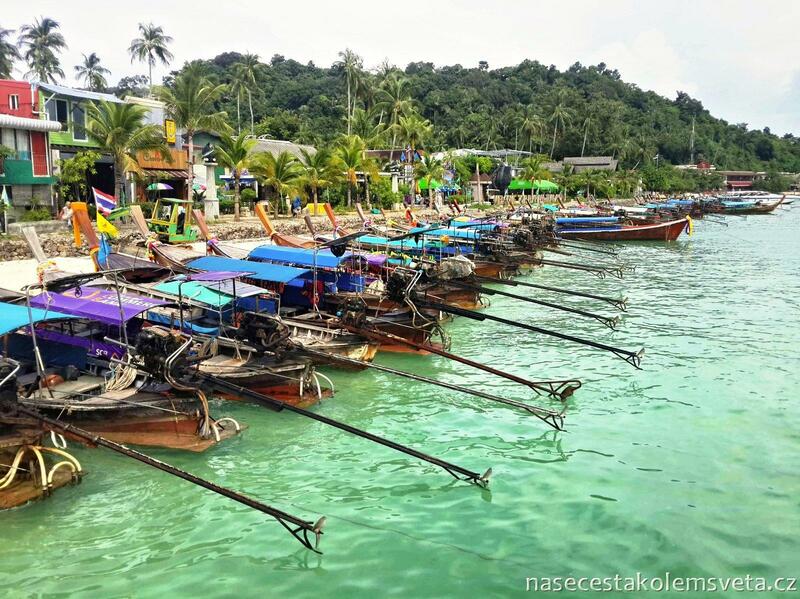 For 600 THB/person (cca 16.80 USD) we took a boat trip. First we stopped on a desolated beach full of monkeys. Very inquisitive and playful. 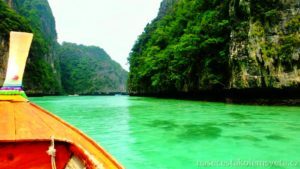 Then we headed directly to Maya Bay on the most renowned beach in Thailand everyone knows from movie The Beach. It might have been a paradise on Earth in the past. But today it is unfortunately very polluted bay full of rubbish excited tourists leave here. The rear part of the island looks little better and one can walk there. In the pas it was also possible to camp there for free but no longer today. If you want to camp you can do it on the boat and pay 3000 THB/person/night (cca 84 USD). It is of course possible to get here very early in the morning on a private boat but then you need to be willing to pay 500 THB/person for 1 hour (cca 14 USD). Well watch our photos and make yourself an opinion but you will probably agree that paradise on Earth looks different. Part of the trip was also snorkeling on the other side of Phi Phi Ley Island in Pileh lagoon. Very beautiful spot with crystal clear water and before there had to be also living color corals. But due to the Thai greed and money chase these corals are dead and the only thing you can observe here are spectacular shoals of fish. It just felt so sad when we saw how nature is being destroyed so people can see and visit everything.